Well, it seems a US release date has finally been set for Matt Damon and Ben Affleck's latest Project Greenlight venture, and judging by the artwork (see left) and the trailer (see below) we're quite looking forward to this one. 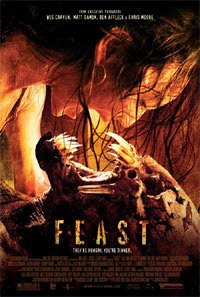 Directed by John Gulager, and written by Patrick Melton and Marcus Dunstan, the monster splatterfest Feast which stars Henry Rollins and Krista Allen is now going to be given a limited theatrical release on September 22nd. If you can't find it in US cinemas during its brief run, then don't worry as the DVD is now apparently set for an October 17th release, so we over here in the UK can order our Region 1 versions then. Synopsis: "On one snowy and fateful evening, an odd assortment of diverse characters, known only as “Heroine,” “Hero,” “Bozo,” “Beer Guy,” “Boss Man,” “Grandma,” “Bartender,” “Vet,” “Coach,” etc., are brought together at a secluded bar. A man covered in blood suddenly bursts through the door, with some bizarre creature gripped firmly in his hand. He warns everyone of an inexplicable invasion: a group of flying, flesh-starved beasts, eager to devour anyone that stands in their path, is out on a rampage. Now, this bizarre group of people must band together if they are going to survive the night. They have to stave off this invasion by any means necessary, or else they will all be picked off one by one."